The former Colorado governor is one of the only Democratic presidential candidates to oppose Alexandria Ocasio-Cortez's signature plan. He has a reason. It’s popular. A whopping 91 percent of likely Iowa Democratic caucusgoers say they favor candidates who support it, according to a Des Moines Register poll. And all six Senate Democrats running for president co-sponsored Ocasio-Cortez's bill. Former Rep. Beto O’Rourke said, “I haven't seen anything better” to fight climate change. Enter Hickenlooper, who made his opposition to the plan plain in a Washington Post op-ed titled, “The Green New Deal sets us up for failure." His campaign then made sure reporters saw the op-ed and made him available for interviews. "I wasn't out there trying to rip anything apart," Hickenlooper told NBC News in a phone interview. “I agree completely with the sense of urgency — we're within a decade or so of suffering irreversible damage of the planet." He likes the idea of a Green New Deal, just not this one. He pointed to its inclusion of issues like a federal jobs guarantee. His op-ed cited a fact sheet put out by Ocasio-Cortez's office that doesn't reflect the content of her bill and which she later disowned, and criticized the plan for not acknowledging the role of the private sector nor the economic dislocation that would result from abruptly killing the fossil fuel sector. “Campaigns are about different voices and different positions, and I felt there was a benefit in beginning the discussion around what would a more focused Green New Deal would look like,” he said. 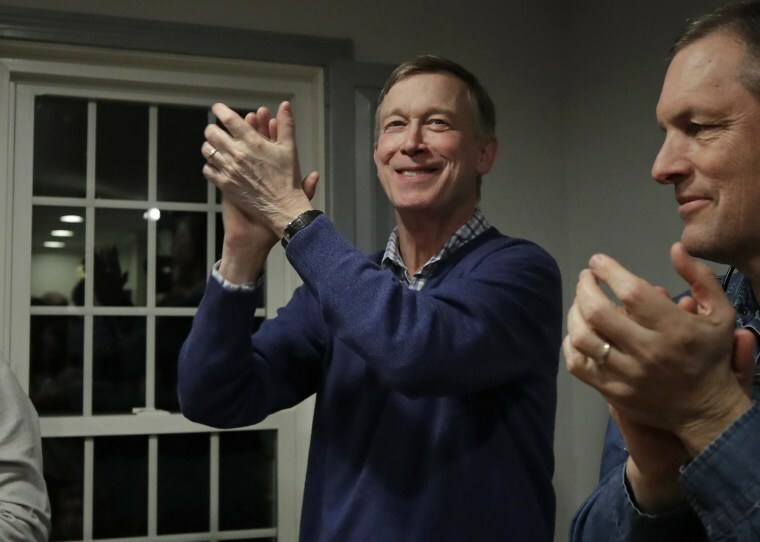 Politically, the move helps Hickenlooper carve the ideological space he hopes to occupy in the crowded primary, which his advisers see as open to big ideas, but pragmatic. It's a position that has sometimes seemed muddled, like when Hickenlooper struggled to answer whether he's a capitalist. The only other candidate to vocally oppose the Green New Deal is former Rep. John Delaney. It’s a faith in compromise — critics would say a blind one — informed by his experience in Colorado, where he facilitated a process that led to fracking regulations embraced by both extractors and environmental activists.